Welcome to another edition of “vs”! Sag Harbor came out a couple years ago now. It’s a pale dusty blue with silver shimmer. Sea Spray came out last year I believe, and it’s also a light dusty blue with silver/light blue shimmer. In the photo above they basically look identical. Hard to tell which is which (I had to write it down in case I forgot actually!). There are some very subtle differences though, but would take a really keen eye to see them. Here you can see the differences a little better. Sag Harbor is a slightly brighter and lighter blue. It’s also not as dusty grey looking as Sea Spray. The shimmer in Sea Spray looks to have some light blue in it rather than just silver like Sag Harbor. I think the biggest difference though lies in the formula. Sag Harbor is fairly thin and definitely needs three coats for full coverage. 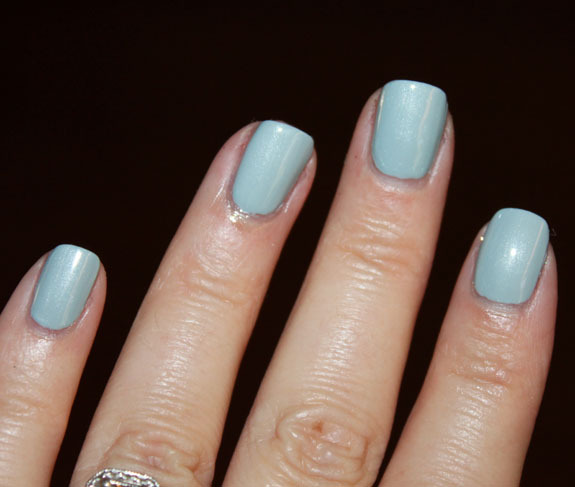 Sea Spray is thicker and more opaque and you only need two coats. For me there is also the issue of cruelty-free companies. Essie themselves are cruelty-free however they are owned by L’Oreal who are not, so I don’t buy or review their new products anymore. Something to consider if you are trying to go cruelty-free. These colors are so extremely close that it would take a REALLY hard look at them to see the differences. They aren’t dupes exactly but SUPER close. 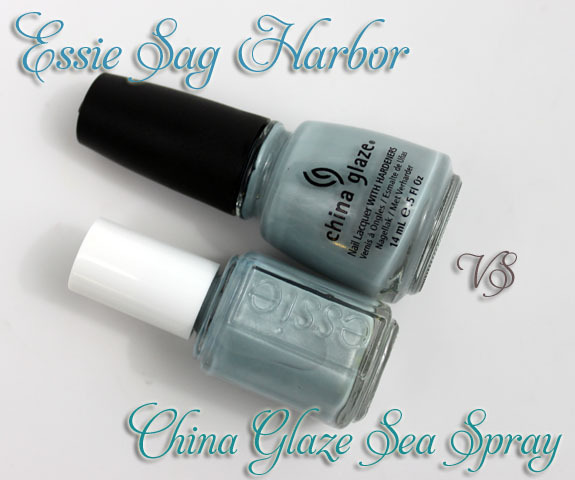 For me it’s Sea Spray because not only are China Glaze not owned by any big yucky company (and they best keep it that way), the formula is better! What do you think about these two? Which is your preference or are they so close it doesn’t matter? Wet n Wild Color Icon Eyeshadow Trio and Mega Last Lipcolor Giveaway! I own them both and didn’t even realize they were dupe-y, although I knew they were pretty close. Oh well, it’s a good color at least, although I prefer the CG formula. Thank you so much for this! I love the color of Sag Harbor but hate the application. I’ll swap it away and get Sea Spray! Phew. I felt like I needed to hunt this down and now I’m just fine with Sea Spray. Thanks Kelly! Great comparison swatches and review! I do prefer Sag Harbor, but the differences between it and Sea Spray are so minute that I think Sea Spray is the better deal considering the price, formula, and accessibility. I think I’ve already got the Sag Harbor, so I’m good. Thanks for the comparison, I’m trying to cut back on my polish habit, and the dupe posts are helpful! I had recalled you saying something about no longer buying Essie a while back, that’s very good to know, however unfortunate. I don’t have either of these but I do have Butter London’s Lady Muck and now I’m curious how it compares with these two! Lady Muck is totally on my list, even though I’ve already got numerous light dusty blue-grey shades. Butter London polishes have, in my fairly limited experience, GREAT formulas (Victoriana is a fave). Essie, otoh, I frequently dislike. So many of their polishes I’ve bought have been too sheer, too chalky, streaky, or slow-drying (one was even kind of… gritty? SO WEIRD). The only Essie I really ever use now is a clear with sparse ultrafine silver glitter – great as a top coat. Very nice formula and color, if anything Lady Muck might have a little more visible silver shimmer. 🙂 Victoriana is the other BL I own and absolutely loooove! And thank goodness for Ulta coupons on those! I don’t have Lady Muck sorry! They are both gorgeous! My blue obsession continues! Darn! Wow! They are super close – close enough I would not want both…and I did not get Sea Spray this past spring when that CG collection came out that upset me because they did not release that collection at Sally locations. I was really sad and hope that CG does not start doing that all the time. I depend on Sally’s for CG and is the whole reason I buy a Sally’s card even! Sag Harbor was in a GREAT collection. I am kicking myself I did not pick up the green one in that group…called Greenport…impossible to find now. I love these colors, they give you such a nice pop of color, and look soo nice with tanned skin. 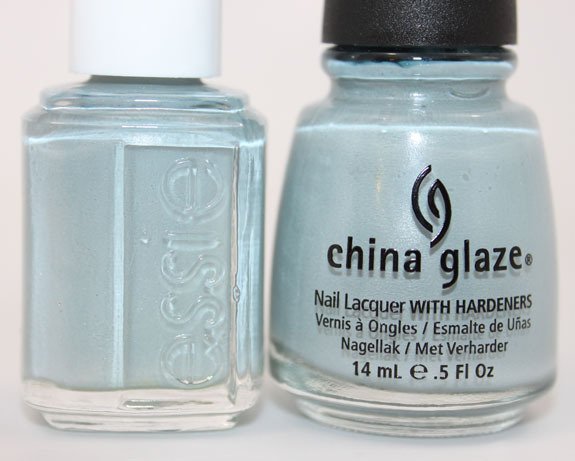 I think they look almost idential, but I too would go for the China Glaze version, because I just like CG better. I wonder if they are similar to “I vant to be a lone star” from the OPI Texas collection???? China Glaze somehow for me is already so usual, so i am trying new after new to don’t get bored! I have Sag Harbor and just adore this on me. Looks so good if I don’t say so myself. Sea Spray for the same reasons you advance i.e. it’s not L’Oreal. I don’t do Essie or OPI any more. Definitely Sea Spray; for the price, the formula and the cruelty-free company. This collection was never available near me but the more swatches I see of Sea Spray the more I want it. Gonna have to hunt it down! I’ve been trying to figure out whether Essie is still cruelty free or not, they’re no longer listed on either list on the PETA website. I just emailed Essie through the website inquiring about their animal testing status so hopefully they get back to me soon. If they are still cruelty free, I think it’s important to purchase their products to show L’oreal that there is a market for cruelty-free cosmetics and that people actually care about that! They’ve already stated that they’ll be going cruelty free in 2013 so that’s awesome!